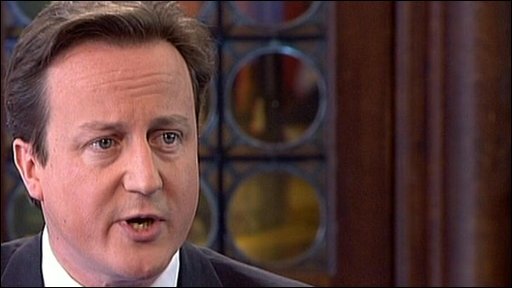 David Cameron: "We have seen from the prime minister a certain weakness"
Conservative leader David Cameron has told the BBC trade unions "scented weakness" in the government's response to Unite's row with British Airways. He said Gordon Brown failed to back non-strikers, although Mr Brown said he wanted "negotiation" to take place. The comments came as the latest strike by cabin crew entered a second day, with both sides claiming an advantage. The airline has cancelled 30% of flights from the UK on Sunday, including 42% of Heathrow departures. So far 131 flights from Heathrow and a small number of flights from Manchester, Newcastle, Aberdeen, Edinburgh and Glasgow have been cancelled. But the airline said services from Gatwick Airport and London City Airport would be operating "normally". Unite has said BA was wasting millions of pounds by paying other airlines to carry its passengers. 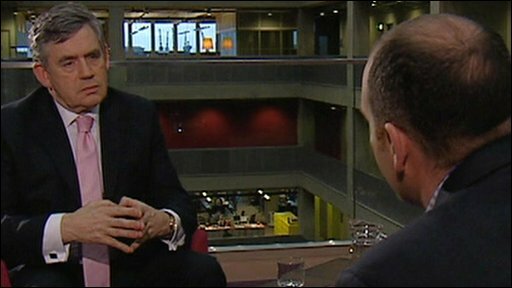 Speaking to the BBC's Politics Show, the Conservative leader criticised Prime Minister Gordon Brown for failing to back those cabin crew staff who chose not to strike. He said: "I think a leader should say 'of course, if people want to go to work, they should go to work and I back them going to work'. "I think the unions have scented weakness in the government and that's one of the reasons why we're seeing quite so many strikes." He also referred to the first national rail strike for 16 years - at Network Rail - which is due to start next month. But Mr Brown told the programme: "We want BA workers to be back at work, so we've said we don't want this strike. But we also want to make it possible for arbitration and negotiation to take place." He said the number of days lost in industrial disputes under Labour is a 10th of what it was under the last Conservative government. His comments were echoed by Ed Balls MP, who told the BBC's Andrew Marr show "it was complete and utter nonsense" to say that government was unable to take tough action over the strike because of the Labour party's relationship with the union. One striker, who wanted to remain anonymous, told the BBC a lot of those on the picket line were single mothers who did not want to be on strike but felt they had no other option. She said staff felt bullied and harassed and felt the company was trying to break the union. She said: "We give our heart and soul to this airline and that's what we're fighting for." Heathrow passenger Josh Philpotts said: "I think the strikers are the ones in the wrong. I just think that in a recession they should be grateful for a job." But Elizabeth Larnach, whose BA flight to Glasgow was among those cancelled, supported the action and said staff were not paid enough. BA has said it hopes to fly more than three-quarters of passengers departing from UK airports during the four-day strike, which began on Saturday. A spokesman said: "The numbers of cabin crew reporting at Heathrow are currently at the levels we need to operate our published schedule." 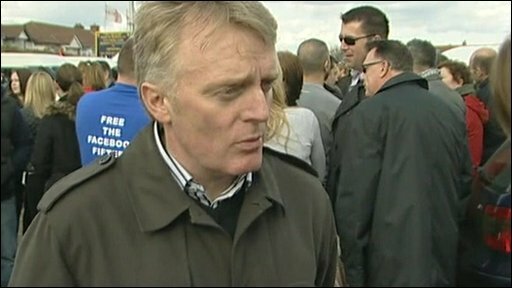 Boss Willie Walsh said the airline was doing "everything possible" to achieve that and was committed to resolving the dispute. Unite said with no sign of an agreement over changes to pay and conditions, strike action could continue after Easter, although no further action would be taken before 14 April. The union's national aviation officer, Brian Boyd, said it was hopeful negotiations could resume before then. "We have a two-week period now over Easter where we have said to the British public that we would not be disrupting Easter holidays for families. "But we're hopefully going to be speaking with the company but that'll be down to the company because, at the end of the day, if we have a resolution to this, it has to be negotiated." On Saturday, the airline cancelled a third of departures - about 90 flights, mainly out of Heathrow. Passengers in the US have also been experiencing problems, with several flights into and out of New York's JFK airport from Heathrow cancelled. The dispute centres on BA's cost-cutting plans, including reducing the numbers of cabin crew on long-haul flights. BA estimates that last week's three-day stoppage cost the company £21m.